The BOXER family of lightweight coherent ground surveillance radars are manufactured by Kelvin Hughes Surveillance Ldt. primary sensors for threat detection over land. These has been designed to meet specific requirements of defence, paramilitary and security users. BOXER SharpEye™ X-Band surveillance radars are low cost, low power consumption, lightweight, ultra-high reliability, superior in performance and will integrate easily with electro-optical systems. The combination of SharpEye™ advanced Doppler processing and a new electronically scanned phased array gives the user a unique set of scanning options, electronic beam steering, continuous scanning including all round scanning and stare capability. 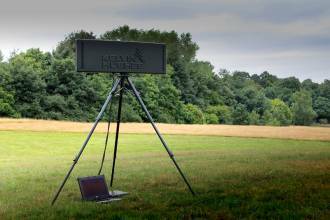 BOXER is a real time long range surveillance radar capable of providing detection of extremely small and slow moving targets in bad weather, difficult terrain, day or night. It is the ideal surveillance solution for forward operating bases protection, Special Forces missions, border monitoring and critical infrastructure protection. BOXER is designed to integrate with camera sensors and C2 systems. Kelvin Hughes provides following variants of the BOXER ground surveillance radar which operate in the X-Band frequency range, are solid state transceivers, providing long and short range surveillance and security capabilities. MPS Family – Portable system designed to be carried by two persons or on a quad bike. Mounting methods include tripod and vehicle mast. MDS Family – Trailer / small vehicle mounted system designed to integrate with other sensors and function autonomously or be networked. MIS Family – Fixed installation system that discreetly mounts on the side of building or mast providing real time long range surveillance. The BOXER MPS range radars are designed for easy portability by personnel on foot, quad bike and all-terrain vehicles. Incorporating SharpEye™ technology and providing multiple mission options through clever use of power inputs and mounting methods, the MPS radar system is suited to the battlefield, temporary or forward operating base protection, and security operations. The BOXER MDS deployable systems are designed for extended periods of mission deployment yet easily transported on an all-terrain vehicle, autonomous trailer system or as part of a integrated portable container. Depending on the role of the deployable system our BOXER ground surveillance radars incorporating SharpEye™ technology can be configured for the deployment role. The BOXER MIS deployable systems are designed for direct installation on a building, perimeter boundary or mast. Focusing on the protection of critical infrastructure BOXER MIS incorporating SharpEye™ is configured as a low power dual short range and long range radar.